Unique water dispensing device for birds! A unique way to provide water for the birds. Water from this generous reservoir automatically fills four individual drinking spots. When birds drink the water it is instantly replenished. The large three quart capacity means fewer refills. When filling, simply remove the colorful royal blue water reservoir and fill it with fresh cool water. In between fillings both the reservoir and the drinking pools can be washed with warm, soapy water. As the birds bathe in or consume the water, it is instantly replenished from the reservoir. * Can be post mounted on 4 x 4 inch post or hung. Includes "S" hook. Clear blue with black base, in easy to clean plastic. The basin is 11 inches in diameter with a 1-1/2 inch depth. 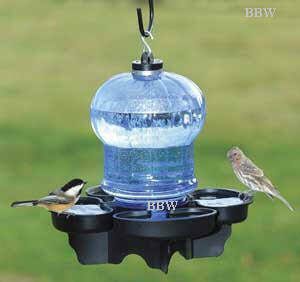 Combo birdbath, water cooler, water dispensing device for birds. Unique Hanging or post mount birdbath or bird water dispensing device.